Belton, John, “Medieval Modernism: Bunuel’s Autobiography,” pp. 29-34. Biro, Yvette, “In the Spiral of Time,” pp. 173-77. Brooks, Virginia, “Film, Perception, and Cognitive Psychology,” pp. 105-26. Buchsbaum, Jonathan, “Peter Wollen: In Search of Political Film,” pp. 61-71. Camper, Fred, “Film: The Front Line,” pp. 48-56. Carroll, Noel, “Medium Specificity Arguments and Self-Consciously Invented Arts: Film, Video, and Photography,” pp. 127-53. Casebier, Allan, “To the Distant Observer,” pp. 35-41. Friedman, Bernard, “The EFC Arrives: A National Coalition of Experimental Filmmakers,” pp. 178-80. Horn, Lawrence, “On Video and Its Viewer,” pp. 155-64. Jarvie, Ian, “Visible Fictions,” pp. 57-60. Keller, Marjorie, “Women and Film,” pp. 43-47. 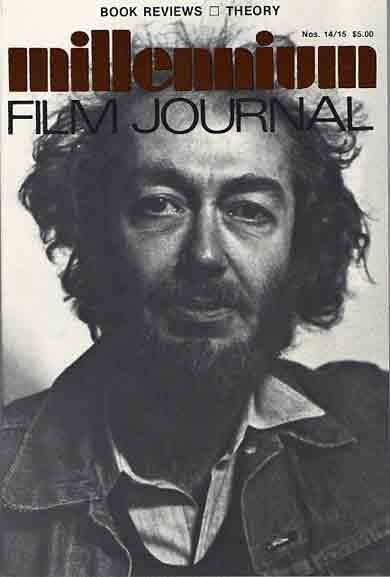 Margolis, Joseph, “Film as a Fine Art,” pp. 89-104. Sharrett, Christopher, “Brakhage’s Scrapbook,” pp. 23-27. Sitney, P. Adams, “Circles of Confusion,” pp. 7-13. Sparshott, Francis, “Medium and Convention in Film and Video,” pp. 72-88. Thompson, Kristin, “Eisenstein, Marshall, and Soviet Cinema,” pp. 15-21. Walworth, Dan, “A Partial Report from the 34th International Berlin Film Festival,” pp. 165-72.